Q. What are the specifications of the Hoks? Q. What are the differences between the 2 sizes of Hoks and how do I pick a size? The 145 has a little more “ski” DNA in it and works better for those looking to use the Hoks in a more downhill fashion. The 145 has a bit more glide as well, but is less maneuverable in tight spaces. The 145 has a bit more floatation for deep snow and BIG skiers. The 125 is better as a snowshoe substitute, more maneuverable, better in thick woods and brush, lighter, and a little better grip. The 125 is also easier to control for those unfamiliar with skis. Both sizes turn well with the 125 being a bit easier due to the length, but also a bit less stable at speed. Skier size and weight does come into play when sizing the Hok but we feel it is on equal footing with the intended use and conditions. As a general rule women of average size weight or smaller should use the 125cm, and men over 6ft at average weight could go with the 145cm. But for general use and as a snowshoe substitute the 125 works best even for larger men. We originally were going to do just the 125 and did all our testing on that size (2 medium to large guys). The Hok length affects the boot/binding you use as well, with the 125cm being easier to ski with a light boot or the universal binding. Q. What is the difference between the Kōm ski and the Hoks? The Kōm and Hoks are designed to be quite different in how they perform and are used. The Kōm is designed much closer to a normal backcountry ski, with a few modifications. Both will travel well in the backcountry, and are designed with that in mind. Here are some of the differences in use and performance between the two skis. – The Kōm is a bit narrower under foot, but has more sidecut. Generally you would ski the Kōm longer then a Hok. The Kōm will perform better (more like a normal ski) on downhill terrain. – The Kōm has a fishscale base. This allows the ski to glide faster, but in all but warm spring snow the Kōm will not climb as well as a Hok due to the Hok’s slower but grippier climbing skin base. This can be particularly pronounced in deep cold snows and on crusts, where scales do not grip well. We recommend an add on climbing skin for the Kōm if a lot of steep and or sustained climbing is in the desired usage. – The Hok can generally be skied with a lighter boot, particularly if one is just out touring. – The Hok, because of its forward mounting position, will often break trail better as it tends to be very even weighted, keeping the ski balanced when moving through deep snow. – The Hok will be more maneuverable in thick forest or brush, and is very easy to turn at slow speeds and has a very even swing weight. – The Hok is great for backcountry travel where simplicity of moving through mixed terrain is desired. – For downhill skiing in the backcountry, the Kōm is very well suited, and turns well with either tele or parallel turns. – We recommend the Kōm with a light plastic boot like the Scarpa T4 or the Garmont (now Scott) Excursion. For all but brick hard snow or aggressive downhill, the Hok can do well with a sturdy leather boot and lightweight 3pin binding, universal binding, or a Salomon or Rottefella BC system binding. Q. Help! Snow is sticking to the bases of my Hoks. Is there a wax for this? Mostly the Hoks are fine to use as is. Conditions where you might have clumping or icing are the same as with all skis – new snow warming right around freezing. The best is to wax if you anticipate this being the case – i.e. before you are out there and the problem occurs. Our in shop treatment is to use Silicone spray from Napa auto parts. Spray the whole ski (base and skin), rubbing the silicone in side to side (NOT up and down). Let them sit until dry (maybe 30 min or less) then use. Swix F4 paste wax works well too, and is available through our website. Other options are the various skin waxes available, paraffin, and XC paste glide waxes. DO NOT try to hot wax the skin, it can be damaged by excessive heat and clogged by melted in wax. In the field, the F4 works best and can be put on the whole ski base, skin and ptex (you will find the ptex ices up as much as the skin). Again, rub the F4 in side ways into the skin nap. Have a snack while it dries a bit then you are good to go. A small PLASTIC scraper can be handy to have in the field to clean the base before applying the wax. A credit card works in a pinch. Q. Is there a general maintenance I should do to the Hoks? The Hoks do not need a lot of maintenance. We recommend making sure the bindings screws are tight (if they loosen, put some blue locktite in the inserts). If the bases start to look dried out you can rub xc paste wax or hard (glide) wax on them. Silicone spray, xc paste waxes, or skin waxes can be rubbed on the skin part of the base. When not in use, keep in a dry place (do not leave them sticking in the snow – especially wet snow – all winter. Clean off excess snow after use, especially in the binding, so it does not freeze in place. Q. What is the screw size of the inserts in the Hoks? The threaded binding inserts in the Hoks are stainless steel and the thread size is M6 (6mm). We use different length screws for different bindings. – 3pin: toe piece is 12mm length, custom AS heel piece is 16mm. – The adapter plate insert screws are 20mm length. Q. I have screws coming loose in the inserts, what can I do? Screws can be prone to come loose especially when the are metal on metal like on a 3 pin binding. We include a pillow packed of thread locker with our 3 pin kits and Heel kits. Use according to the directions. If you don’t have this or need more you can buy locktite at any hardware store and add that to the inserts before screwing in the screws. We recommend the blue (product #242) non permanent locktite. We also use zinc coated screws, not stainless. The inserts are stainless and mixing stainless with stainless can lead to the screws binding or seizing up in the inserts. Q. Where did the design and graphic come from on the Hok? Q. Hok is kind of a weird name. How do you pronounce it and where does it come from? Pronounced like the bird of prey [hawk]. The word Hok is very close to the Tuwa work for ski. The Tuwa have a HK sound that is something not found in English, but to the western ear is sounds like Hok. The Tuwa are actually Tuvan and moved south to the Altai probably in the last 400 years. They are the most avid skiers and are true mountain dwellers (and hunters). They are also one of the smallest ethnic groups in the Altai and number fewer then 4000 in the Chinese Altai region. Q. Where are the Hoks made? The Hoks are made in a small factory a few hours south of Shanghai, China. The factory has about 40 employees and makes skis and snowboards exclusively. Q. Can I mount other bindings on the Hok? Yes. Using the adapter plate, you can mount SNS BC or NNN BC bindings directly on the Hoks without drilling. There are also several other Nordic style bindings that can fit the adapter plate, check with us for more details on this. You can also mount AT and some telemark bindings using Quiver Killers (http://quiverkiller.com) on the Hoks. We do not warranty this but it has been done by a number of users. Q. What if there are rocks and dirt where I ski, will this ruin the bases? Since the advent of modern Ptex based skis, rocks have been the scourge of all ski bases, with some bases being more prone to damage(fishscale bases in particular) then others. The skin part of the base on the Hoks can also be damaged by rocks, gravel and sand. Avoid these when you can, but it is possible to cross bare spots and rocky gravelly areas if one is careful. Rule #1 is never slide on rocks, gravel, sand, or hard woody debris. Always step lightly when crossing any of these and the Hoks will be fine. We ski early and late season a lot on the Hoks and so encounter poorly covered or melted out areas often and the ‘step lightly’ technique has worked well in all our “testing”. Q. How durable is the skin material on the bases of the Hoks? The nap material (hair) of the Hoks skin is nylon and very durable. 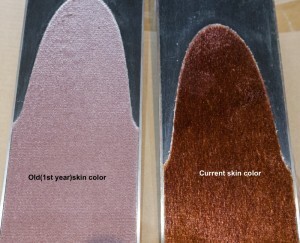 We have Hoks with well over 100 days on them and the skin still looks and works well. The material can get gouged and scraped by rocks in particular so avoid sliding over any rocks, gravel, sand, or hard woody debris. Step on or over these obstacles as needed. We have never seen any sign of frozen or crusty snow wearing out the fur or hair on the skin material. Finally, if you think your skin is really past its life, they are replaceable as long as they are not from the 1st year Hoks. Contact us for more information on this. Q. Is the skin material on the Hoks replaceable? Yes, as long as it is not from our first year Hoks, You can contact us for replacement, and we have also have a few replacement inserts with a peel and stick glue on the back. This requires a bit more work on your part, but if you are reasonably DIY proficient it is doable at home. Q. What if the skin material gets gouged or comes loose in a spot? The Hoks have a 1 year full warranty on them and if your skin delaminates beyond that from normal use we will repair it free of charge. The skin material on the Hoks is easily repairable barring catastrophic (as in major delamination) failure. We can also repair it here for a small fee. Q. What are the specifications of the Balla Hoks? Q. What ages are the Balla Hoks designed for? A. The Balla Hoks are designed to be a ‘first ski’ for kids – ages can be 4-5 years. Because the binding is adjustable and fits a normal boot the Ballas will work well for a number of years, depending on size and ability. The Hoks are not as size sensitive design as other skis are, with the 125 Hoks being used by almost any size adult. Q. What size boot will the universal binding on the Balla Hoks fit? A. Currently, the Balla Hok universal is a cut down version of the adult universal binding. Q. What are the specifications of the Kōms? 150 cm – 78.5cm straight line from the tail to the 3pin line – (not the boot centerline). 162cm – 86cm straight line from the tail to the 3pin line – (not the boot centerline). 174cm – 92.3cm straight line from the tail to the 3pin line – (not the boot centerline). Q. How does the fishscale base work compared to the skin base on the Hoks? The Kōm’s fishscale (no-wax) base works well for climbing moderate angles. Compared to XC ski no-wax bases it is quite aggressive and will climb well in most conditions. We still use climbing skins for steeper mountain touring, but the fishscale base remains incredibly useful for poking around (snow assessment) short climbs, or crossing flats or small climbs encountered on a run. Approaches to tours and ridge line traverses can often be done with just the fishscale base as well. You will find that they climb best in warm wet snows and are less effective in deep cold snows. The fishscale is least effective on really hard icy snow, as the scales cannot penetrate to gain traction. Q. Can I put skins on the Kōms? Yes. Regular skins can be added to the Kōms just like a normal backcountry ski. The Kōms have a tail notch for the skin hook. We are also working on developing our own dedicated skin that will be available as an add on for the Kōms. Q. Can I wax the base of the Kōms? Yes, you can hot wax the tips and tails but do not hot wax the scales, as they will plug up with wax and lose effectiveness. We recommend a liquid or paste wax on the scales like Swix F4. This can be used on the whole ski and works well to eliminate snow sticking (clumping) when in transitional new snow right around or above freezing. Q. Is there any general maintenance I should do to the Kōms? Q. Can I mount AT bindings on the Kōms? Q. How do I measure to mount bindings on the Kōms? Our measurements are measured in s straight line from the tail to the “pin line”. This is the line where the pins (or imaginary pins) sit on a 75mm or 3 pin binding. This is a standard reference point used for nordic (XC) bindings. Q. Where does the name ‘Kōm’ come from? Kōm is the name of one of the main mountain villages in the Chinese Altai. The locals have a KH sound we do not use in the west so it could be spelled Khom but for (relative) ease of pronunciation we simplified it to Kōm. Q. Where does the graphic on the ‘Kōm’ come from? The graphic is from the ancient Deer stones that are found throughout the southern Siberia step region from Eastern Mongolia to Western Kazakhstan. They date back as far as 1000BC. Q. What size of boots will the Universal Binding fit? Depending on boot style (single or double boot), the regular universal binding will fit from a 6 women’s to a 12 men’s. For larger sizes we have a Universal Pivot binding that fits up to a size 15 (depending on style), and can cut down a regular Universal to fit smaller sizes as well. Q. Will the Universal Binding fit Bunny boots? We have found it will fit some smaller sizes but the Pivot is generally the best choice for Bunny boots, especially larger men’s sizes. Q. Is there a information sheet on Universal Binding? Q How do I mount the Universal Binding on my Hoks? There are 3 screws per binding that simply screw into the inserts on the Hok. All you need is a #3 Phillips screwdriver. Alternate tightening the screws so the binding plate stays parallel with the ski as it is screwed down. Finish with a snug fit of the bottom of the binding against the Hok. Do not over tighten! Q. I have lost a screw on the Universal Binding, what size is it or do you have more? The size for the inserts on the Hoks is M6 (6MM) and the length we use is 25mm. You should be able to find them at a good hardware store but if not contact us. We also use zinc coated, not stainless. The inserts are stainless and mixing stainless with stainless can lead to the screws binding or seizing up in the inserts. Q. I have a broken flex plate on my binding and you sent me a new one, how do I put it in? Flex plates are warranted against breakage for normal use with a flexible soled boot. They are very easy to replace and require a phillips (#3) and a flat head screw driver. See the PDF attached. Q. What is the warranty on the Universal Binding? We warranty the Universal for 1 year from date of purchase. We keep spare parts as well so contact us if you need anything for your bindings. Q. Is there any maintenance on the Universal Binding? Not really. We recommend cleaning the snow out of them after use so it does not freeze up and make use the next day difficult. If snow is sticking to the toe plate you can put some wax like Swix F4 in the area to reduce this. Clean and store in a dry place at the end of each season. Q. The Universal Binding does not go big enough for my boots, what can I do? 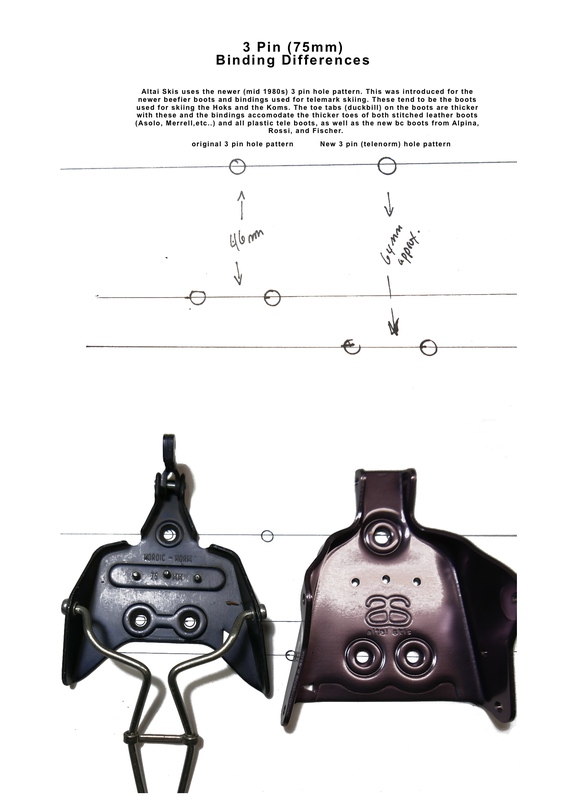 We sell a larger size called the Universal Pivot binding that can go up to a size 14-15, depending on the boot design. Q. The Universal Binding does not go small enough for my boots, what can I do? Contact us and we can cut a pair down to fit smaller sizes. Q. The Universal Binding is long enough for my boots, but the straps are too short, what can I do? Beyond the ratchet strap adjustment, you can carefully unscrew the ratchet side of the strap (both toe a ankle straps) and adjust the strap in or out using the screw and Tnut provided. Q. What are the pros and cons of the Universal binding you sell for the Hoks? The universals work great but have limitations over a dedicated boot-binding combo like the 75mm/3 pin (my favorite). If you are using the Hok more as a snowshoe in moderate terrain, the universal works well. Q. What are the pros and cons of 75mm (3 pin) bindings for the Hoks? At Altai Skis we all prefer the 3pin (75mm) binding system. the boots are plentiful and appropriate models range in price (new) from $150 – $300. We also really like the old Italian leather boots of the 80’s and 90’s, which can be found 2nd hand for as little as $10(score!). We sell some used ones here at the shop for around $60. The 3 pin is a simple binding with a wide frame that gives the user a lot of leverage on the binding and ski. For maximum control and lots of downhill type use the lightweight plastic Scarpa T4 and Excursion (Garmont and now Scott) are great choices. We sell the T4 in our US store. We offer both the straight 3pin binding – light and simple – and the 3 pin cable, which adds a bit more lateral stability to a boot. Here are some(but not all) of the many excellent boots out there right now. Q. How do I know if my 3 pins will work on the Hoks. A. There are two types of 3 pin bindings with different hole configurations. We sell the heavy duty ones that were introduced in the mid 80s with the resurgence of telemark skiing. they have a longer (more spread out) hole pattern and take boots with a thicker toe tab (the ‘duck bill’ on the front of the boots). The new heavy duty backcountry boots by Fischer, Alpina, and Rossignol also have this thicker toe tab. For more information and some images check out this PDF on the differences in the two 3pin (75mm) mounting patterns. Q. How do I adjust the cables on the 3pin cable (75mm) bindings? The silver spring cables spin in or out like a large screw. Each side is adjustable to keep the heel piece centered on your boot. New, adjust one to desired tension (I prefer just enough tension to make the spring action engage) and then match the other one to this and then hook it on the other binding. In the field, you can unhook 1 side and spin the heel piece to fit, then rehook. If you have these on the Hoks, the ski is too wide to hook both from the top so one needs to be hooked from the bottom and one from the top. Q. My cables are too long on the 3pin cable (75mm) bindings. Is there a way to cut them? Yes, you can cut them with an angle grinder and a metal cutting disk, or use a bolt cutter. In the US store, we can cut them here ahead of time if you give us your boot size. Q. What kind of maintenance is there on the 3pin or 3pin cable bindings? Not much! Clean the snow out at the end of the day so it does not freeze up in the binding. Waxing the toe piece helps (but does not completely eliminate) snow icing up in the toe piece in the right conditions. The cables can have wax rubbed on the ends to make them spin smoother. Q. What is the warranty on the Tiaks? We warranty the Tiaks for 1 year from the purchase date. Q. How do I know what size Tiak to use? Sizing is not critical, but roughly 8 to 12 inches taller then your height is a good fit. Q. Is there any maintenance needed for the Tiaks? Do not leave them standing in wet snow for days at a time as they are wood and will soak up moisture. If the Tiak starts to look dried out (especially on the bottom end) you can oil it. We use a linseed oil mixed (50/50) with paint thinner or kerosene (this allows for better penetration into the wood). Q. What are the Tiaks made of? Tiaks are made of Lodgepole pine, selected from dense stands that grow in higher rocky terrain. This makes them very slow growing and strong, with a typical 1 ½ inch diameter selected tree being 50-60 years old. Q. What does Tiak mean? Tiak means, literally, stick in the Kazakh and Tuwa languages found in the Altai. Q. Is there any instructional material on how to use a Tiak? The tiak is used like a tripod, not a rudder or break. The tripod is an inherently stable formation and can easily adjust to fit changing terrain and stance. Skiing with a single pole is also the oldest style of skiing dating to its origins. This was the way all skiing was practiced until early into the 20th century. Q. What about using 75mm (3 pin) boots for the Hoks? Here are some (but not all) of the many excellent boots out there right now. A. Measure your foot with a ruler, using cm or inches; convert to Euro or US using this chart. If you need mondo sizing, please refer to the SCARPA chart. ◦ Shell fit: taking liner out of the shell and inserting foot, toes touching end of shell but completely flat. ◦ Use and orthotic? Put it the boot (after taking out the standard footbed). ◦ Boots do pack out! A ‘comfy’ fit when new will mean slop later. Regardless, your toes should NOT be pressed against the end of the liner. Note that the plastic shells are sized 1 per whole and 1/2 size while the liners are sized to every half size. This means that the 1/2 and next whole size share the same shell (example would be the 8.5 and the 9). On the chart this is color coded either grey or white. Q. How long are your skis straps? Our ski straps (made by Voile) are 18 inches and easily accommodate the Kōms and Hoks as well as their binding. Because of the strap’s tension and no slip design, one can be adequate for a pair of skis. Q. Who do you ship with in the US? Currently we ship with USPS (post office) and UPS. Because of pricing, all tiaks go USPS priority. SInce we offer free shipping we reserve the right to choose the best option. Most items in the west go USPS priority, large orders and East coast generally go UPS ground. Q. Can you do expedited shipping in the US? Yes. We currently have 2 levels available to AK and are working to program a expedited shipping option into the website for the rest of the US. Q. Why do you ship some shipments with USPS ? USPS (the post office) has proven to be the least expensive and fastest for the price for many items and locations. Priority tends to be as fast or (mostly) faster then UPS ground. Priority also includes tracking information. You should get a email alert upon shipping with the tracking number. Priority is a much better value to AK as well as for tiaks which are oversized. Yes. We can ship (depending on country) UPS or USPS. For some countries (particularly Australia) we can recommend Shipto as a good and affordable option. Q. How do I return ship? If you have an item to return please contact us for a return authorization. You can call us in the US at 509.779.0030 or email us through the contact page. Q. Where do you ship from in Canada? Our fulfillment center is located in Southern Quebec, which is where all merchandise is shipped from. Q. Who do you ship with in Canada? Our fulfillment center ships with multiple carries depending on price and availability. If you have any questions or concerns please contact us. Q. What credit cards do you take? We Take Visa, MasterCard, and Discover. We cannot currently take American Express on the website. You can also use PayPal if you have an account. Q. Why won’t you store my credit card information? We choose not to store your credit card information to protect against theft and hacking. Our site is very secure but with recent large scale hacking reported, we feel it is better to reduce any potential risk. Q. Is you site secure? CyberSource is committed to privacy and security. CyberSource is compliant with the Payment Card Industry Data Security Standard (“PCI DSS”) as a Level 1 service provider. PCI DSS is the bankcard industry’s most stringent security standard. Beanstream is a PCI Level 1 (the highest level) certified service provider. This means we hold to the highest industry standards for data protection and network security, and your business and cardholder data is safe with us. As part of our ongoing security program we perform rigorous checks of our systems, both internally and via independent third-parties, to ensure we meet or exceed card association requirements. Beanstream has also met these rigorous Canadian audit controls for financial service providers: SSAE 16 SOC 1 Type 2, CSAE 3416 and ISAE 3402. Q. What is the warranty on the Hoks? Hoks are warrantied 1 year from the date of purchase against defects or breakage. Q. I live in another country, how do I order your skis? In Canada, you can order directly through our Canadian order page here . For other countries, please contact us for distributors in your area. You can sign up from our website, there is a black bar at the bottom of the page, and in the bottom right corner there is a place to fill in your information and subscribe. Also, when you are placing your order you will be automatically put on our mailing list unless you opt out. Q. How do I get off your mailing list? If, you do not want to be on our mailing list when you place your order, there is an option to say no to receiving our newsletter. If, you are on our mailing list and receive an email from us, that has been sent using mailchimp, there will be an option in the email to unsubscribe from our newsletters. Q. What is return/refund/warranty policy? To return your item you must first contact us at Altai Skis either by e-mailing us at info@altaiskis.com or calling us at (509) 779-0030. At this point, if your return is approved we will give you a return authorization number. If, your return is a warranty issue Altai Skis will send you a return-shipping label to cover shipping costs. For all other return reasons you will be responsible for return shipping costs. We will warranty our skis against defects in materials and/or workmanship for one year from the date of purchase. Though we are not the manufacturer of the Xtrace universal binding, we will also offer a limited warranty for the binding for defects in materials or workmanship for one year. We reserve the right to repair or replace the product as we see fit. If you have any questions on how to return your item to us, contact us. Located below is the contact information and return shipping address.